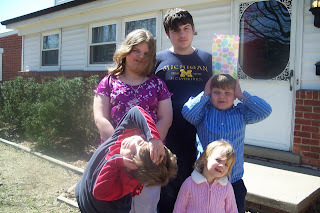 The kids love Easter time. They love coloring eggs. They love the anticipation of the loot (candy). Along with the candy, we make sure they know why Easter is a very special time to celebrate. Not only did Christ offer us the most precious Easter present, Salvation, but He also showed us through that how much He loves us. What could possibly be more of an example of that love than to die for my sinfulness. 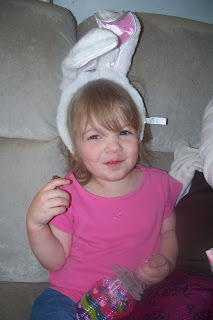 One of the most exciting things that we are celebrating this year is that through Christ's blood God has offered each of us the gift of salvation which my five year old has accepted this very Easter. It is amazing to me to watch each of my children give their hearts to God in acceptance of His precious gift. It is the most precious aspect of me being parent who has been entrusted with these children to raise to love the Lord. When they finally come to the point of understanding and they give their hearts fully to God, I am so proud of them and the choice they've made. I continue to pray that each will make this relationship between them and God their very own throughout their lives. It is amazing to me to watch how God has taken this relationship with our oldest and has lead him through a series of events just this past year to make it real to him. I pray that new understanding continues to grow and flourish as he lives his life and develops that relationship with Christ. 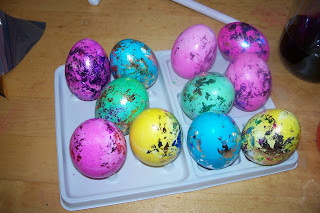 This year I found this cool Easter egg glitter pack for the kids to dye their eggs. I think Grace and I ended up doing all the glitter part. It took a little longer than some the kids were willing to wait for. So they put their order in for what color of glitter paper they wanted on their egg. 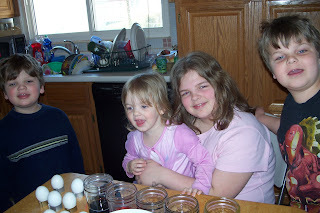 Grace and I sat there and finished all the eggs up. Brad didn't want to participate this year which was sad for me. I do acknowledge that perhaps at some point, a teen may consider egg dying lame. Ah, time. It flies before your very eyes. At least, I have one last picture of him from last year which he reminds me that I 'forced' him into. Poor kid! In Aaron and Ryan's little Easter bag, I got these really cool looking eggs that are suppose to hatch and grow a duck or a chick. Unfortunately, I didn't read the directions on the back which said that it takes about 72 hours. Aaron's hatched into this slimy duck in about 48 hours but only because I dropped it before placing it in the water, therefore, pre-cracking it. Ryan's, on the otherhand, is still in the water trying it's very best to hatch. I think we are going to have to help it along. I must admit that they were more patient with it than I anticipated. I am so very excited that Spring is here and with it, the reminder that Jesus is ALIVE! I believe it is so important in sharing testimonies to God's faithfulness. It builds our faith up and inspires, encourages us to continue moving forward with the calling God has placed on our lives. We had noticed that our next door neighbor had been home all week. This was unusual since he goes to work early in the morning during the week. So they had been on my heart as I wasn't sure if he got laid off or lost his job. One morning, as I was taking a shower, I felt a real pressing to share some of the food we had with them. Of course, I debated back and forth for a bit thinking of how much we needed that food and how they probably were just fine justifying my decision to not go through with it. However, God just laid it out on my heart about obedience. When He calls us to do something, we better do it and not wait even if it doesn't make any sense to us. The decision was made to do what God had laid on my heart, to give the food in faith and in obedience. It happened that he was out in his driveway working on his car. My husband went out there to ask him if he had been laid off and he said he hadn't. He was just home taking care of his wife who had had surgery on her foot. My husband asked him if he could use some extra food and he replied without hesitation that they could. I loaded up several bags of canned goods and a few things from my freezer. Then, we took them over to them. Our neighbor was just amazed at the amount of food we were giving them. He asked us how we had all this 'extra'. I, then, was able to explain to him how God had provided in abundance to us and how he continues to provide. He kept commenting about how he couldn't believe that we have friends that would just give us food. I also told him that we were praying for quick healing for his wife which took him by surprise also. To us, it was simple gesture. Nothing evangelical. Nothing super spiritual. Just purely trying to live life as God commands us to. The next day, we walked into church and a lady there said that she just couldn't get us off her mind. She wanted to know if we needed food. Of course, I replied with a yes as I was thinking about my rather empty cupboards. She loaded up our car with groceries from the church pantry. That evening, I had another neighbor come over to tell me she put us on her prayer list at her church and that their church wanted to bring over some groceries that week. They showed up with eight bags of groceries. A couple days later, a friend showed up with fresh vegetables, salad, and potatoes from the market. And then finally, another woman gave me meat and ice cream from her freezer. At then end of the week, my oldest son commented that we had been given more than we gave. That was an important lesson on obedience and I couldn't have taught that to my kids any better. God is our provider and we need to trust that He knows best. He has already set the path before us. Another thing that happened just this past week was that we were out of milk. We go through about a gallon a day so this is always a need. It had been a particularly tight week financially so my husband took my hand and as we stood in the kitchen, he prayed that God would provide milk. Within four days, we had ten gallons of milk. I totally believe that God will provide when we pray but when it truly happens and over what I expect, it is overwhelming. God promises to provide and we are living examples that He does what He promises. As His children, we are not dependent on this economy. His ways are higher, wider, and deeper than anything we can imagine. Trust Him, obey Him and live your life for Him. You will be amazed at what He does.